and transfer to Ta Som Guesthouse / 3* hotels. to the Roluos Temple group, located in the Southeast of Angkor. Visit Lolei, Preah Koh and Bakong Tempel. In Roluos, the first temple mountain of the Angkorian plain was built, the Bankong. Study the principles of Khmer architecture whose evolution you will later see in the other places of this intensive tour. Entering this once largest city of the world form the South Gate, you admire the street of 108 gods and devils. with its famous face tours (the "smile" of Angkor) and bas reliefs from the 14th centruy, depicting the daily life that doesn't seem to have much changed until now. Easy walking tour to Baphuon Temple and Phimeanakas Temple. We walk further to the Terrasse of Elephants and Terrasse of Yama (the so called lepra king) and see the fantastic reliefs. Time for lunch in a local restaurant with good view to the historical central place of Angkor Thom. You should try the good noodle soup! Optional: You can start your visit by riding a balloon (staying on the same place, around 15 minutes!). Great roundview. Take your best fotos! Sunset from Phnom Bakheng (very busy but famous for sunset) or Preh Rup, a lovely and quiet place to reflect your discoveries in Angkor. Transfer back to Ta Som Guesthouse for optional dinner in our Ta Som Garden Restaurant. Try the famous traditional Amok Fish, delicious and not spicy! In the evening, opitional Apsara Dance, only 200 metres from your guest house! Your English speaking tourguide will explain the meaning of the sun in relation to the tempels' architecture. What means the "temple code" of Angkor Wat? After having discussed these questions, you have breakfast ( as breakfast box) on the pittoresque Srah Srang Water Basin. Enjoy this quite place, the former royal bath. This tour is easy and takes us about two hours. (In our opinion as tour agency, walking is a much more intensive way to "feel" and to "smell" Angkor than sitting only in a car and getting off at some spots. The EFEO (Ecole Francaise d'Extrême-Orient) has decided to keep this tempel overgrown by the jungle. Enjoy the trees growing out from the temple ruins and feel like the first explorers and "rediscoverers" of Angkor, like Henri Mouhot or Lunet de Lajonquière. In the afternoon, we explore Preah Khan Temple (with hugh trees overgrowing the ruins). The temple complex has been ideally restored by the World Monument Fund. Learn about the enormous looting problem in Angkor and the important savegarding and preservation activities of the WMF. Go on seeing the most important spots on the "grand circuit", like Neak Pean (holy bath) and the Eastern Mebon (with Elephant statues). Visit Ta Som Temple built by King Jayavarman VII dedicated this temple to his teacher.Enjoy the famous eastern gopura of Ta Som. Take your picture! Sunset from Pre Rup or from another place (according to day 1). Transfer back to Ta Som Guesthouse, optional dinner. On this second day, you should try the traditional beef loklak, together with a refreshing and vitalizing pineapple juice! After your second day in the temples, you might be tired and need a good massage? We can organize traditional khmer massage by blind for just US$ 6 per hour (optional!). enjoy an excursion in the Northern part of the Angkor Archaeological Park. On your way, you pass through picturesque landscapes with ricefields and sugar palms to another highlight of Angkor: the famous and precious Banteay Srei Temple..
Banteay Srei means "the citadel of the women" and is reknown because of its incredible sandstone carvings looking like wood. It really deserves the name "diamond of Angkor". where in Angkorian times, thousands of Lingams (the phallus symbol of the Lord Shiva) have been carved into the riverbed, in order to fertilize the water going down to the Angkorian plain. This place is called Kbal Spean or the River of Thousand Lingams. Easy Walking tour (about one hour) through tropical dry forest and see the different places of carvings in the riverbed. Your experienced English speaking tourguide explains you the meaning of the interesting carvings. Time for lunch in a local restaurant in Kobal Spean (not included). Driving back to Siem Reap, you also visit Banteay Samre Temple. Optional dinner in Ta Som Garden Restaurant. 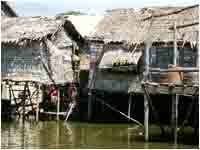 Transfer to Phnom Krom on the shores of the Tonle Sap Lake. Enjoy a boat trip (about two hours) on the Tonle Sap Lake, the greatest fresh water reservoir with the highest biodiversity in the world. See the floating village of Chong Kneas. Learn about rice cultivation, fishing techniques and life with and on the water. In the evening, enjoy a classical Apsara dance show. This is your explorer's day! Thanks to a new road, we can go now in one day to hidden temple areas, that have just recently been opened for tourists. Feel like the first explorers of Angkor, when you stroll over ruins and through deep tropical vegetation in Koh Ker and Beng Mealea. After early breakfast in Ta Som Guesthouse, start northeastwards, after 1 ½ hours, arrive in Koh Ker. Visit at first the 35 metres high temple mountain, called Prasat Thom. Drive around by your car to remote temple areas with gopurams and nice carvings and lintels. See the holy lingams in the cellas. Visit the stone carries, where the sandstone, used for building most Angkor temples, was broken. Feel like the first explorers when you search your way over broken ruins and temple walls. The large temple area is still overgrown by the tropical dry forest. Beng Mealea temple is on the old Angkorian roads leading from Angkor to the Great temple of Preah Khan of Kompong Svay. You will see some of the old stone bridges. In the late afternoon, you drive back to Siem Reap, to Ta Som Guesthouse. 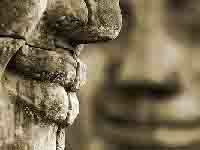 End of package tour "Angkor Explorer". You can add more nights in Ta Som Guesthouse and choose among our interesting daytrips. To complete your Angkor experience, we highly recommend the "Bird Sanctuary Prek Toal", where you will feel like in a Hitchcock's movie and our "Countryside Tour" where you go deeper into the way of living of the locals (ricefields, sugar palms, water buffaloes). This life doesn't seem to have much changed since Angkorian times. Walking tour through "jungle temples" Banteay Kdei and Ta Prohm (about two hours). Accommodation for four nights in Ta Som Guesthouse / 3* hotels in air conditioned twin room with private ensuite bathroom with cold/hot water, minibar, Cable TV. Lunch box on day 5 (picnic in Beng Mealea). The entrance fee for Angkor Archaeological Park (ticket). The price for 3 persons is based on accomodation in triple room.